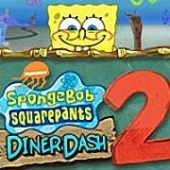 SpongeBob Diner Dash 2 – From SpongePedia, the biggest SpongeBob-wiki in the world! SpongeBob Diner Dash 2: Two Times the Trouble is a sequel to SpongeBob Diner Dash. This page was last modified on 19 April 2011, at 21:03.